The Early Bird offer runs until Midnight tonight (July 7th). Please, note that RealPlayer will be updating the landing page images earlier at 5PM PST today to which will reflect the regular offer of $39.99. However, the coupon code is still valid through midnight, so you must manually enter the coupon code: BB12QTEARLY to receive the discount and pay ONLY $29.99. LIMITED TIME OFFER Expires TODAY! See what they can’t show you on TV!! When you sign-up for the Live Feeds, you will be able to watch the entire season of Big Brother 12 for ONLY $29.99!! That’s $10 OFF the regular price! Try the Live Feeds for Free and watch the first 3 days of Big Brother 12 with the: 3 Day FREE Trial! 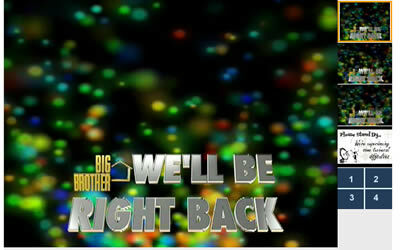 The new Big Brother 12 Flash Based client is now running.. If you have your feeds nows a good time to test it all out. Here the schedule of Events for the next couple days..
Chelsia and Missy kick off a new season of Big Brother with a big, new online call-in show. Call 877-448-6639 with your questions and comments on the new season. House Secrets with Missy Z.
Missy goes online with a new webchat hour for Big Brother fans. Join her in the Big Brother chat room to dish about House happenings. I’ve been reading some of the other blogs (sorry Simon) and found out some interesting things about the “Saboteur” twist. Simon, my loyalty is to you and this site. You have the best cast of comentators of all the sites I read. The others pale compared to the “crazies” on this here site. That’s why I am back for another season. Good luck and see you tomorrow nite. hey jimik, Thats great information thank you for sharing it. These last few hours of waiting are going by so slow. Can’t wait till tonight!